Saving your natural tooth is usually preferred to alternative options. 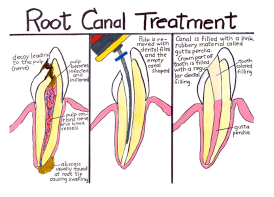 Root Canal Therapy is used to repair and save a tooth which the nerve is in the process of dying or already has died. During a root canal procedure, the nerve and blood vessel material is removed within the roots of the teeth and the inside of the tooth is cleaned and sealed. Root canal procedures have the reputation of being painful. Actually, most people report that the procedure itself is no more painful than having a filling placed. The discomfort experienced is the period leading up to seeking dental care is truly the painful period of time, not the root canal procedure itself.